Wednesday, February 22, 2006. I’m heading for Window Rock in northeast Arizona, almost New Mexico. Bright sunny day. Leaving Phoenix is always a joy. I like to see the city and its blight drop over the horizon in my rearview mirror. Phoenix recedes in stages. Off the freeway on to the Beeline Hiqhway north across the Salt River Reservation. The immediate landscape is sparse and open, reservation houses on my left, sand and gravel operations and, farther north, the big landfill. Lots of red tile roofs in the distance to the east. North of Shea Boulevard and the Fort McDowell casino, I cross the Verde River, leaving most city signs behind me. Not all, scattered houses are still visible. But soon even those intrusions are gone. Now the Superstition Mountains stretch east and south. North and east is Four Peaks, the southern rampart of the Mazatzal Mountains. North of Four Peaks road, I cross into the Mazatal Mountains. Phoenix is well out of sight and mind now. As if to celebrate, cresting the ridge offers a panoramic view of Round Valley, the wide, rugged basin cut by Sycamore Creek. The landscape is open and expansive. The many rocks, crags, peaks and canyons give the valley a feel of greater depth and scope. Yet this is only a small space in the scheme of things. How truly massive is this planet of ours. I climb over ridges, in and out of basins, gradually working up the Sycamore Creek drainage, snaking my way through. Crossing Sycamore Creek for the last time, the road follows Kitty Jo Creek as it climbs the southwest face of Mount Ord on the Mazatzal Divide. After the divide these mountains are to my left as I head into Rye Creek drainage. The Mazatals are my mountains. I’ve walked this range many times beginning in 1983. Mostly four and five day trips and usually without seeing other people. Although the wilderness area is within a couple hours of a major metro area, few venture here. The Mazatzals are rugged and difficult walking. Solitude and grandeur. Worth the effort but it’s a big effort. The long climb from Rye to Payson goes quickly. I head east on Route 260 on a combination of new and old roadway. The road runs under the Mogollon Rim, a long escarpment that is the southern face of the Colorado Plateau. New construction has all but obliterated the old two lane route. Driving is much easier on the big, new road. Climbing again, this time to the top of the Rim, with views of the Mazatzals to the south and west. On the Rim, I stop and nap for a while. Through Forest Lakes and Heber before heading north toward Holbrook. Still climbing. Landscape is sandy, rocky and brushy. No big vegetation, juniper and pinon pine, open range. Nearing Holbrook, I see the buttes and mesas north of the Little Colorado River–Navajo country. To the west I catch a glimpse of the San Francisco Peaks, a small blue-gray jagged bump on an otherwise flat horizon. Turning east on I-40 now. Traffic’s not too bad. Moving fast. Across the Painted Desert, north of the Little Colorado River and then the Rio Puerco. The land is wide open, mostly empty except for the railroad tracks that parallel the highway and scattered Navajo Homes. East of Holbrook is the Dinosaur Park with its life-size beasts posed along highway. Big as they are, the dinosaurs look small against this land. Near Petrified Forest National Park the land turns strange, undulating bands of red, gray and their infinite permutations wrap around hoodoos and other surreal formations. Farther east, I am heading toward the sandstone ramparts that mark the Arizona-New Mexico border. The sheer cliffs shine brightly, tinged with a red. At Lupton, two miles shy of the state line, I turn north on Indian Route 12, heading deeper into the Rez. The road is narrow, two lane but good. The land is bent, uplifted and eroded, mostly forested. A few dwellings and buildings are along the way but they are pretty spread out, often family compounds. I see houses of all shapes and states of repair. Mobile homes, stock pens and derelict vehicles. A small human presence on a vast land. Oak Springs is a community of buildings and home sites clustered around the Chapter House. Now I climb the final ridge. I can see Window Rock in the distance, across a rocky, tilted landscape. In Window Rock, I am back in a city but it is small in scale. The town sprawls across Black Creek Valley, homes, businesses, livestock, government all together in this remote space. The land is open under an infinite sky. The sandstone cliffs on the east glow fiercely in the late afternoon sun. Checked into my motel, I eat and then walk, following a bike route from when I lived here. It climbs to the ridge overlooking the Window Rock, a solitary natural arch formation in the sandstone. As I climb I pass what I call BIA Hill, an area of finely built stone homes that must have housed officials from the Bureau of Indian Affairs who oversaw the Navajo Nation in the pre-sovereignty days. The stone is red sandstone cut into broadly faceted blocks, the style is distinct and common among the older tribal headquarters buildings. One house is noticeably larger than the others–the superintendent’s, no doubt–and has arguably the most spectacular view in the area. The view looks down the valley and encompasses the cliffs, now exploding with light at sunset. About half of the houses, including the big one which looks renovated, are boarded and vacant. Others are occupied, many with large gray-blue shipping containers nearby. Several houses have been well restored. Dogs bark at my passing. The few who come forward to challenge me retreat at my sudden increase in size as I raise my arms and hands, moving toward them. At the top of the hill, I see the Window Rock. My position is almost as high as the arch and overlooks the Navajo Nation government buildings surrounding the Council chambers. It's twilight as I descend. The sun is behind the Defiance Plateau in the west. Horses graze alongside an abandoned road. Two, both white, turn toward me as I pass. One looks like it is coming to check me out but it cuts behind me with its companion. The air cools quickly. This day is done. [editor's note: A road trip is not exactly at the speed of foot but the Arizona landscape is so immense that it can be grasped even traveling at highway speeds. Of course, that requires observation, a skill learned at the speed of foot which is why I posted this story here. Plundering my AT and Vietnam journals was an effective way to generate regular posts for this site in the past year which cranked up my visibility a bit. The daily postings from Vietnam were especially good for increasing visitor numbers. Since visibility is a key to marketing I guess I will have to find an equally good way to keep this blog active. Daily posting is unlikely. It was hard enough when all I had to do was edit something I'd written before; coming up with daily material for more than a few days just won't happen. My Unsolicited Opinion blog also demands a certain amount of content simply because I have a need to speak out on public issues and culture even though no one asked. Most material for that site is not relevant to this one, although you will see some overlap here and there. Aside from offering interesting and informative content, an important focus here is to get people to read At the Speed of Foot. Judging from Kindle sales that is happening, which is pretty cool. I still have lots of paperback copies and would be delighted if more readers purchased print copies but the electronic sales and comments from readers has been more than satisfying. My worst fears as a writer have been shown to be largely unfounded, although one reviewer did call it "tripe", a word I often used myself as I wrote. In the end, At the Speed of Foot is the story as best I can tell it. Everyone is free to make their own judgment. Expect to see more journal entries from past hikes. I had a good time revisiting my AT and Vietnam journals, which is the whole point of writing a journal anyway. Maybe I came up with some good ideas for future essays and posts. Going back to my other journals might give me some more ideas. Expect to see a few book reviews, too. I write a capsule description/review of each book I read; one or two might be worth posting. 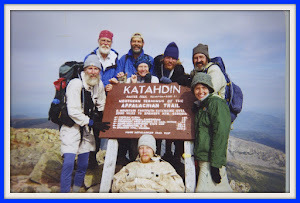 Expect, too, accounts of actual hikes and adventures in the here and now. Arthritis has made me less inclined to take on a demanding hike but I can still walk and still very much cherish any time that I can spend deep in the back country. Anyone coming to this blog looking for Appalachian Trail material in the past month or so might have been baffled by the extended posts about a trip to Vietnam now two years past. But anyone who's paid attention to my writing over the years will know that Vietnam is very much part of me. And because Vietnam is part of me, my return there in 2010 is a logical consequence of my AT thru hike. Walking on the AT I came to terms with my participation in the Vietnam War. That experience germinated a longstanding wish to see Vietnam in peace, to perform some form of constructive activity. Two years ago I did exactly that. Reading my 2010 Vietnam journal and before that my AT journals, I am awash with a wondrous sense of change, of resolution at the end of both adventures. Awash and wondrous are the cardinal words here; the changed perspective feelings felt life-altering. Looking back, the change is real but much less dramatic. The Vietnam War will always be with me. Along with the experience of war these days are pleasant memories of a countryside at peace, gracious Vietnamese hospitality and the fun of working with the English language students and teachers in Da Nang. It all balances even if the balance isn't permanent. The Vietnam War static in my head isn't gone but it's definitely muted. The new balance was evident during the holiday season just past. Before 2010, the Thanksgiving-Christmas season was always a reminder of being sent to Vietnam. After 2010, I still remember that earlier dark holiday but memories from the more recent trip come to mind as well. 17 January 1987. Grand Canyon, Arizona. Hiked down to Horseshoe Mesa with Gary. Our original plan was a with a club trip down the Old Hance Trail, looping back up to the mesa and climbing out on the Grandview Trail. A winter storm led everyone else to drop out. Gary and I took off early this morning from Phoenix to see if we could get on to the mesa walking the Grandview Trail. The road from Flagstaff to the South Rim was snowy in places but the weather was otherwise okay. The day is bright, sunny and cold as we head down Grandview. We break new snow--slow going but fairly easy otherwise. We have the mesa to ourselves and spend the afternoon exploring. The Cave of the Dome is located on the western rim of the mesa. We crawl trough the entrance and explore the interior. It's warm inside. Our lights do not provide much illumination. Later on we poke about the old mine on the eastern side. The entrance is blocked; we can get through but we don't go far since the shaft is unstable with unmarked vertical drops. We eat an early dinner and dive into our sleeping bags in the last light of day. The temperature is 29 degrees and falling at sundown. Last week I learned that the term for a group of vultures is "committee". One such committee took roost in a Northern Virginia neighborhood. The event and efforts to encourage the committee to meet elsewhere were reported in a Washington Post local blog where I found the reference. Gives new meaning to a committee meeting. Olympia froze last night with a low of 22 F and freezing fog almost to noon. Once the sun came out around mid-day, the temperature got up to 36 and the day was bright and sunny in between scattered clouds. Still the day never thawed out much. I saw lots of ice--in drainage ditches, driveway puddles and a fair amount on the larger ponds--on today's bike ride. I rode north through northeast Olympia and Thurston County to the northern terminus of the Chehalis Western Trail, followed the trail to Yelm Highway and worked my way back through southeast Olympia; just under 24 miles. The ride was cold. I put an extra layer on my torso but stayed with a single layer long tights under my cycling shorts. This winter is the first where I've regularly worn rain booties to keep the wind off my feet and full fingered cycling gloves. Today I wore micro fleece gloves as a base layer. I thought the extra torso layer would be too much but I never overheated. My fingertips were often cold but not enough to go to a heavier glove. Around three o'clock in this neck of the woods this time of year, whatever warmth has accumulated begins to dissipate as the sun heads toward the horizon. I could feel the change as I rode . By the time I got home my feet were especially cold. I got several views of Mount Rainier, totally blanketed in snow, shining like a jewel in the east. No matter how many times I see that sight, I am always awe struck. Today was no different. 8:58 At Noi Bai Airport waiting for our flight to HCMC and then home. Ride out from Ha Noi was pretty quick and check in crowds minimal. On the ride out Maggie corrected my memory of Ho Chi Minh's lying-on-display suit. I recalled it as pale, no doubt from the memory of his white jacket on display at the museum. That display includes his sandals made from tire treads and inner tubes, his "lunch box" and helmet. It is all so very simple. It was that simplicity combined with discipline and determination that won Vietnam's independence and reunification. Just as American simplicity defeated the far more sophisticated and powerful British forces in the 18th century, so too did Vietnamese simplicity outlast American power 200 years later. 16:11 Seated on Eva Air flight 396 from HCMC to Taipei. Our flight down from Ha Noi was short and easy. Left us plenty of time to make our connection. In a few minutes we will leave Vietnam after 25 days here. I'm sad to see the trip end but also very much ready to get home. I leave Vietnam with many fond memories and a strong desire to return. So very different from last time. 16:39 Up, up and away! Heading for Taipei now and into the coming night. It's 1:40 am Friday morning in Olympia now which means another 16 hours in transit--lots of time to think and reflect on this adventure. I arrived in Vietnam three and a half weeks ago a little uneasy and apprehensive about the trip--not afraid and depressed like in 1970--and it all worked out fine. We pulled off an extended, complicated trip in a very foreign country and, most importantly, changed my whole perception of Vietnam. It went from war, fear and destruction to peace and, if not prosperity, certainly progress. I spent over three weeks not only surrounded by Vietnamese but depending on them. They showed me great friendship and hostility. A few took advantage of me but no more so than would many of my fellow countrymen if they had the same opportunity. The best part was meeting the students in my classes at Da Nang University. They were keen to learn despite their shyness and very positive about life and the opportunities available to them. In many respects they are like kids everywhere which re-affirms my belief in the oneness of the human species. This trip has altered one of my fundamental memories of Vietnam. For the first time in 40 years I did not experience December-January as a replay of those months in 1970-71. This year I focused on the run-up to this trip or the trip itself once in-country. I think that future years will see me replaying this experience along with the orginal. 06:16 Now it's January 8 Saturday in Vietnam. We're about two hours out from touchdown in Seattle where it's still Friday the 7th. I am somewhere suspended in time. The next hurdle on this trip will be getting through US Immigration and Border Patrol, a group about which I am not at all fond. I recall being apprehensive passing through immigration in Vietnam. The officer at my station had the hard look that I associate with the North Vietnamese Army. As it turned out, he just checked my documents and stamped me in. That was the first of many encounters that made this visit to Vietnam so much different from my last. It's ironic that I view my own country's agents with the same apprehension I felt for my former adversaries. Perhaps I will be pleasantly surprised at this border crossing as well. 18:26 PST Friday, January 7, Sea-Tac Airport: I may never get the chance to see how friendly and/or courteous US immigration officers will be. Their computers shut down about a third of the way through processing our planeload of passengers. So we are all waiting, waiting, waiting. From this vantage point, not much is happening. Maybe someone somewhere is working frantically (well, just working) to fix the problem. A guy just walked by with an officer, saying he was here to fix the computers. There is also a rumor that the system is down nationwide. Could be a long night. Last full day in Vietnam and only full day in Ha Noi. We made the most of it, beginning at the Ho Chi Minh Mausoleum Complex. My intent was to visit the site and museum but skip viewing Ho's corpse but the only way into the complex is past the body so I paid my respects in person. The line to visit the body is very regimented. Checked our back packs at the complex gate. Approaching the mausoleum we are issued carry bags for our cameras which we hand over to guards at a security booth before entering the building. We file into the mausoleum past white uniformed guards standing at attention holding SKS rifles with fixed bayonets. Other white uniformed guards instruct us tokeep our hands out of our pockets. We climb a series of stairs, making a few turns and enter the sarcophagus room from Ho's top right, pass around his feet and exit from his top left. Down a couple flights of steps and exit the building where we retrieve our cameras. It's all very respectful but Ho's pale body, neatly laid out in a high-collared dark suit, seems diminished by the the massive tomb. The adjacent Ho Chi Minh Museum remembers a much more vital (and vertical) version of Ho than his nearby corpse. The Ho Chi Minh of history and record is not at all diminished by the massive tomb. The displays reminded me that Ho was dedicated and determined Vietnamese nationalist, which was the core of his leadership and success. Among the many Ho Chi Minh quotations was one about the duty of public officials to remember that all that they have comes from the people which imposes a duty to see that what they have is used well and for the public good. That speaks to me as a long-time bureaucratic guerrilla. Next stop was the Temple of Literature, a public park devoted to stelae recording doctoral examinations given during the 15th to 18th centuries. Each stela is a single stone sculpture about six feet tall and is a tablet placed vertically on the back of a turtle, one of the four sacred animals in Vietnamese culture (the others are unicorn, dragon and phoenix). The tablet records the questions and answers for an individual candidate. The script is in the oriental characters used in Vietnam before introduction of the Latin alphabet in the 19th century. The carvings of the various turtles reflect the changing styles over three centuries. A few turtle noses are worn from students touching them for good luck before exams. There are about 40 stelae in all. Other successful candidates are listed but don't have individual stelae. We had a late lunch at the Koto Restaurant near the Temple. It's a project that helps street kids learn skills that will help them stay off the streets. Food was good and well-presented. We tried to visit the Women's Museum but our taxi driver took us to the wrong location. The walk back to the hotel became an extended quest in search of an inexpensive factory second parka. In the process we saw the most incredible rush hour gridlock--cars, buses, motorbikes and a few bicycles all trying to squeeze through an unsignaled intersection. Motorbikes began streaming down the sidewalks. The din was almost more than I could handle but I managed to stick it out and we finally found that name brand parka for $20. We each bought one. We navigated our way back to the hotel area where we both went for a massage (foot for me, shoulder for Maggie). Then showers. Maggie's asleep now. I will be any minute. 09:26 Morning on the upper deck of the Hoa Binh 22. I'm looking out across the water the the islands of Ha Long Bay. They stretch into the misty distance on all sides under an open gray sky. This place feels timeless, unchanged over millennia. At least as long as I don't look the ferry dock in the distance or the other tour boats clustered here. The mountains and formations rise from the sea, giving the impression of a vast submarine canyon not visible from the surface. Under way again, I see a procession of ridges fading into the distance. The wind has picked up. Time to go below. 21:28 Back in Ha Noi. The cruise ended around 11:00 when we landed back at Ha Long harbor. We were all pretty much ready to be done. One drawback of a tour is the sense of being herded. By tour's end we were all ready not to be herded. After lunch the eight of us from our boat boarded a van for the return trip. Another Australian couple and their young son and daughter joined us. We spent the entire trip in lively conversation. The ride was more comfortable on this trip: better padding on the seats and better suspension. Only 14 in the van compared to maybe 40 in the bus coming down. The trip was still tediously long with heavy traffic which became even heavier once back in Ha Noi. The day was very hazy once we left Ha Long, much of the haze likely the result of the many trash fires we along the way and then the vehicle pollution in the city. The Australian couple who joined us on the ride back from Ha Long, David and Sandra, suggested going for a 25 cent beer at a street pub they discovered on their previous night in Ha Noi. The Australian woman and her son from our ship's company, Kath and George, Maggie and I plus David and Sandra's daughter Indira and son Finn wandered around the corner from our hotel to the street pub which covers the sidewalk and spills onto the street outside a small shop. The beer lasts until the keg runs out. After the last beer we went for dinner with David, Sandra and their kids. Now it's late and I'm tired. Somehow I think I should be writing something more profound but about all I can do is record events. Now to sleep. A quiet night on Ha Long Bay. We are aboard a junk on the water after a day of cruising and sightseeing on the bay. Maggie and I are two in a party of eight that also includes a French couple, an Australian couple, and an Australian woman with her 8 year old son. We came down from Ha Noi by bus--a not exactly brutal four hour trip but long enough. Traffic was wall-to-wall tour buses and trucks. The scene at the docks was equally crowded with nmerous junks jostling to pick up passengers. Once we were on the water, the crowding eased a bit although we've never been out of sight of other boats. Ha Long Bay is a World Heritage Site. Rock formations jut out of the water mostly in rounded shapes but these rock islands vary in size. One is the site of Surprise Cave, a three chambered limestone cavern. Here, too, we traveled with there crowd: boats at the dock and a steady parade of people sluicing through the cave. It's pretty spectacular, even with all of the people. Next up, we visited the Floating Village, a small community that makes its living on the sea and off the tourists. The afternoon was pretty much touching all of the bases on the tour. Dinner was good--this company feeds us well. We watched evening descend ona gray day from the upper deck and spent dinner and the evening in conversation. We dodged the karaoke, which apparently is expected. Our tour guide very much wanted us to karaoke but we just wanted to talk and play a silly parlor game. My kind of crowd. The ride down to Ha Long took us past many fields and through small towns. I spotted four military cemeteries along the way. Very uniform and orderly markers inside some type of ceremonial enclosure. One had a statue of a revolutionary soldier holding his weapon boldly in the air. I also saw what looked like a tablet commemorating a community's dead in the war(s). Our route also passed many factories for western business and consumer products. I saw much small scale and retail enterprise at many points along our route. So even the North, with its revolutionary discipline, looks firmly capitalist. Flew out of Da Nang around 10:00 this morning aboard Vietnam Airlines flight 0308 . The taxi to take off was long and offered glimpses of the airport's past as one of the three largest American air bases in Vietnam during the War. I saw many revetments, concrete arches that shielded planes from mortar attacks. Also saw what I think is the Agent Orange storage area, which makes this airport one of the most contaminated sites in Vietnam. The US has finally agreed to spend $17 million to clean up the area but that amount is only half of the estimated cost and follows three decades of imact on the local populace and ecosystems. Other vestiges of the war are what appear to be control towers alongside the taxiway. They are small so were probably local traffic control at what was a very busy air base. The flight to Ha Noi was only a bit longer than the taxi ride into the Old Quarter where we are staying. Ha Noi is a very gray city and every bit as hectic as Ho Chi Minh City. Our ride progressed from the wide open spaces to ever closer and closer places, finally reach the Old Quarter which is densely crowded, with narrow streets pack with traffic. In the US, these streets would be one-way or pedestrian only but not here. Sidewalks are packed with motorbikes and people. At the hotel we booked an overnight trip tomorrow to Ha Long Bay which Maggie's been talking about since we arrived in Vietnam (maybe before). We explored the area around the hotel and made our way to Hoan Kiem Lake, also called Lake of the Returned Sword which is central to the Vietnamese national identity. We also got ripped off ten bucks by a very fast taxi meter but did find the vegetarian restaurant recommended by a friend. When the restaurant staff heard our tale of taxi fraud, they called a taxi they said we could trust. The fare for the ride back was very reasonable, tip included. Day two of the new year started out slow. I felt particularly unenergetic and lethargic. Something about wanting to be home now. That was not an option and we had matters to attend to on this last day in Da Nang. But first we went for coffee and fresh baked chocolate croissants at Nha Leo which did a lot to change my outlook. Later we spent a few hours at the Museum of Cham Sculpture, which houses...well, Cham sculpture. The pieces were recovered from sites in central Vietnam where the Cham culture, which was highly influenced by Hinduism, flourished between the 2nd and 15th centuries. The collection is a great deal of gray-brown stone carved into many amazing shapes. Dinner was with Tuyet and Chuck at the Dorinly Cafe' where we talked for about two hours. Maggie and I stayed around to listen to music before heading back to the hotel. So Da Nang is almost over. Just a wake up before we sky out for Ha Noi tomorrow morining. Four days later we head home. I will be happy to see Olympia again and sleep in my own bed. But I will also hate to see this adventure end. It's been everything I hoped it would be. Today is more of a holiday than I expected. Many streets are lined with the national flag and most construction sites are shut down. The luxury hi-rise by the river that has been running 24/7 since we arrived in Da Nang is totally closed. So is the construction site behind our hotel. I saw more closed shops today than any day before. All this is surprising since we were told that Vietnamese celebrate the lunar new year at Tet. Looks like they take a holiday on January 1 as well. Later we met students and a teacher from one of Maggie's classes for an extended discussion at a coffee house. Our conversation rambled on for about three hours and covered many topics; English and Vietnamese language, culture, history, Maggie's and my reaction to Vietnam, what we found most surprising, movies, motorbikes and more. Perhaps the most interesting topic for me was their perception of the American War. For them, it's no big deal, a history that doesn't really affect their lives which are firmly in the present. The students are interested in their education and getting on with their lives. Their parents, however, lived that history and still remember the hardships. One student said her mother always changes the channel when a program about the war comes on. In contrast, I told them about Americans who stillhave not gotten over our own civil war. The students found that hard to understand.